Demonstrates how easily we are bamboozled by statistical tricks, making his points with pithy stories. This book helps you to learn how we got here and why smart organization improves our memories and attention - and makes us more imaginative and clear-sighted. Author and neuroscientist Daniel Levitin tackles the problems of twenty-first century information overload in his New York Times and Sunday Times bestselling book The Organized Mind. 'Thought-provoking and practical... Good advice based on sound neuroscientific principles' Sunday Times 'Impressively wide-ranging and thoughtful. There are fascinating facts and examples throughout' Wall Street Journal 'Deservedly a bestseller... Levitin demonstrates how easily we are bamboozled by statistical tricks, making his points with pithy stories' Independent 'Levitin is about as knowledgeable a guide to neuroscience as one might hope for' New York Times Book Review 'More insights per page than any other neuroscientist I know... smart, important, exquisitely written.' Daniel Gilbert, author of Stumbling on Happiness 'Sensible, practical advice... a comprehensive account of the way we think about organizing everything from our possessions to our friends' Financial Times Even the smartest mind can't beat the organized mind . . . In the digital age we are overwhelmed by information. Unable to make sense of it all, our creativity plummets, decision making suffers and we grow absent-minded. The twenty-first century sees us drowning under emails, forever juggling six tasks at once and trying to make complex decisions ever more quickly. This is information overload. 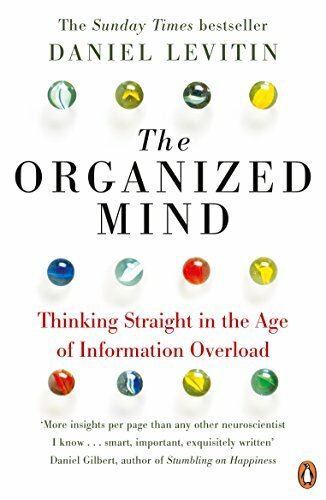 In The Organized Mind, we learn how we got here and why smart organization improves our memories and attention - and makes us more imaginative and clear-sighted. Using a combination of academic research and examples from daily life, neuroscientist and bestselling author Daniel Levitin explains how to take back control of your life. You'll discover that: - Your brain has a daily processing limit - why waste it on cat photos? - Pressing Send or clicking Like gives a dopamine hit - it's addictive - Daydreaming is your brain at its most productive - Multitasking is a bad way to do nearly everything This book will take you through every aspect of modern life, from healthcare to online dating to raising kids, showing that the secret to success is always organization. Levitin's ideas are surprising, powerful and will change the way you see the world. By following the advice in The Organized Mind, you'll function better, go further and find more time to do the things you actually want to do.